Finance minister Michel Sapin has launched a new committee aimed at reviving the Paris stock exchange whose competitiveness is increasingly undermined by European rivals. EURACTIV France reports. Sapin revealed a new committee titled “Place de Paris 2020” on Tuesday (16 June). According to Sapin, its goal is to increase financial support for the real French economy and to revive competitiveness of the Place de Paris (Parisian Financial market) that is running out of steam. “Developing a financial industry which ensures financing to all sections of the economy, especially companies, in a competitive and certain way is very important for France,” Sapin said. 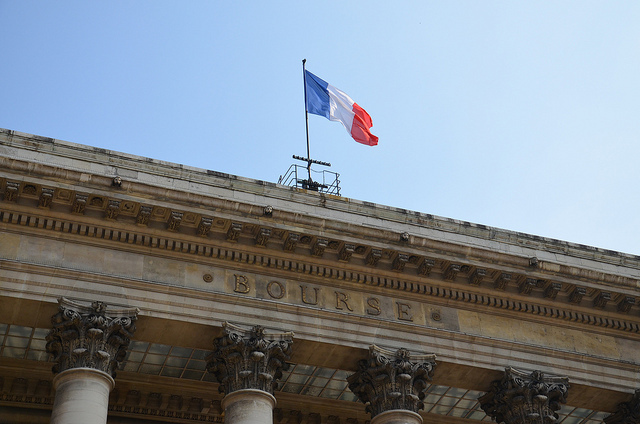 This initiative comes as Euronext will be listed on the stock exchange. Euronext is a pan-European exchange whose major shareholder is the bourse of Paris. In 2007, it merged with the NYSE group which was then acquired by IntercontinentalExchange (ICE) in 2013. ICE will pursue an initial public offering (IPO) of Euronext on 20 June. The French government is ready to intervene in order to prevent other big players from moving in when it enters the market. BNP Paribas and Société Générale, two of France’s biggest banks, have been assigned to secure a blocking minority of 33%. Three working groups were established after the first committee meeting. They will give their proposals to the committee by the end of the year. “Industrial companies need a strong financial market,” said Gérard Mestrallet during a press release with Michel Sapin. Today, 70% of corporate financing comes from banks compared to just 30% from financial markets. This will no doubt change. “Funds from the financial market will be the majority by the end of this decade,” he added. Despite public displays of optimism, the French government is progressing slowly in this area. Mestrallet, President of Europlace, blames the EU financial transaction tax for reducing Paris’s financial competitiveness. “We brought up the matter with the minister. There is a problem with financial transaction tax when they only apply to 11 EU member states,” he said. This was repeated by the French Banking Federation (FBF).”We must get rid of the FTT burden that will be imposed by France and 10 other member states. Extended to by-products, it will lead to massive offshoring of transactions. It goes against efforts to develop the Place de Paris and increase funding from financial markets to the real economy,” said the banking sector in a statement. According to the Authority of Financial Markets, French FTTs led to a significant drop in transactions, about 20% at the time of their introduction and 10% in the medium-term. “I welcome the launch of the committee by Michel Sapin and the Public Accounts. The stakes are crucial in order to increase financing to companies and trigger a return to economic growth. We cannot postpone necessary decisions. It is important to put in place the first concrete measures and to engage in medium-term processes aimed at reinforcing competitiveness of the Paris financial market by 2020, both in Europe and in the world," said Gérard Mestrallet, President of Paris EUROPLACE? Paris Europlace is a lobby group for the Paris financial market. The financing industry represents 6% of the active French population and 4.6% of French GDP. It is adamantly opposed to new European taxes on financial transactions, even though a similar tax exists in France since 2012.